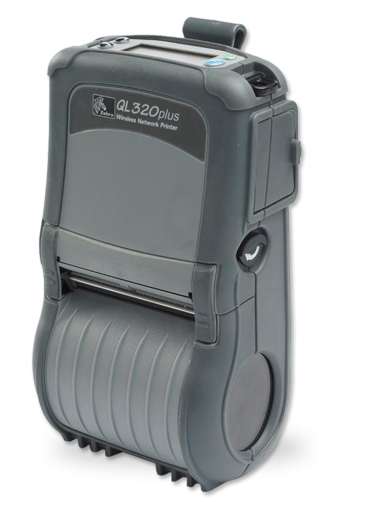 Our refurbished Zebra QL320 direct thermal mobile printer has been designed with the most advanced technology in rubberized over-molding to maintain both rugged construction and minimal weight. Our refurbished Zebra QL320, with center-loading media, smart battery monitoring and an optional LCD, it provides user-friendly options to keep your business moving. All units ship with one user’s manual. Contact us today about buying, servicing, renting or selling Zebra QL320 gear! Need a printing partner tough enough for the concrete jungle? From warehouse floors to parking lots, there are no printers more durable than the QL series from Zebra. The QL series of direct thermal printers has been designed with the most advanced technology in rubberized over-molding to maintain rugged construction and minimal weight. With center-loading media, smart battery monitoring and an optional LCD, they provide user-friendly options to keep your business moving. QL series mobile printers enabled with secure wireless options are easily integrated into your infrastructure. Just a glance at the LCD, and you can read your network settings, or check the communications status. In addition, each printer can be assigned a unique IP address for monitoring over the network, and messages can be sent to the printer using the POP3 functionality. All of these features make the QL printer an integral part of your network environment. Contact us today about buying, servicing, renting or selling Zebra QL320 gear!